The Crusade captures Cyprus and the Kingdom of Cyprus is established. After the failure of the Second Crusade of 1147-1149, the Zengid dynasty controlled a unified Syria and engaged in a conflict with the Fatimid rulers of Egypt. Saladin ultimately brought both the Egyptian and Syrian forces under his own control, and employed them to reduce the Crusader states and to recapture Jerusalem in 1187. Spurred by religious zeal, King Henry II of England and King Philip II of France (known as "Philip Augustus") ended their conflict with each other to lead a new crusade. The death of Henry (6 July 1189), however, meant the English contingent came under the command of his successor, King Richard I of England. The elderly German Emperor Frederick Barbarossa also responded to the call to arms, leading a massive army across Anatolia, but he drowned in a river in Asia Minor on 10 June 1190 before reaching the Holy Land. His death caused tremendous grief among the German Crusaders, and most of his troops returned home. After the Crusaders had driven the Muslims from Acre, Philip - in company with Frederick's successor, Leopold V, Duke of Austria (known as Leopold the Virtuous) - left the Holy Land in August 1191. On 2 September 1192 Richard and Saladin finalized the Treaty of Jaffa, which granted Muslim control over Jerusalem but allowed unarmed Christian pilgrims and merchants to visit the city. Richard departed the Holy Land on 9 October 1192. 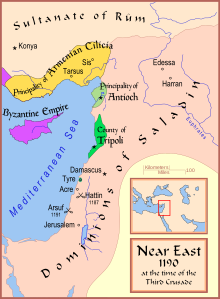 The successes of the Third Crusade allowed Westerners to maintain considerable states in Cyprus and on the Syrian coast. The failure to re-capture Jerusalem inspired the subsequent Fourth Crusade of 1202–1204, but Europeans would only regain the city, albeit briefly, in the Sixth Crusade in 1229. After the failure of the Second Crusade, Nur ad-Din Zangi had control of Damascus and a unified Syria. Eager to expand his power, Nur ad-Din set his sights on the Fatimid dynasty of Egypt. In 1163, Nur ad-Din sent his most trusted general, Shirkuh, on a military expedition to the Nile. Accompanying the general was his young nephew, Saladin. With Shirkuh's troops camped outside of Cairo, Egypt's sultan Shawar called on King Amalric I of Jerusalem for assistance. In response, Amalric sent an army into Egypt and attacked Shirkuh's troops at Bilbeis in 1164. In an attempt to divert Crusader attention from Egypt, Nur ad-Din attacked Antioch, resulting in a massacre of Christian soldiers and the capture of several Crusader leaders, including Bohemond III, Prince of Antioch. Nur ad-Din sent the scalps of the Christian defenders to Egypt for Shirkuh to proudly display at Bilbeis for Amalric's soldiers to see. This action prompted both Amalric and Shirkuh to lead their armies out of Egypt. In 1167, Nur ad-Din again sent Shirkuh to conquer the Fatimids in Egypt. Shawar again opted to call upon Amalric to defend his territory. The combined Egyptian-Christian forces pursued Shirkuh until he retreated to Alexandria. Amalric then breached his alliance with Shawar by turning his forces on Egypt and besieging the city of Bilbeis. Shawar pleaded with his former enemy, Nur ad-Din, to save him from Amalric's treachery. Lacking the resources to maintain a prolonged siege of Cairo against the combined forces of Nur ad-Din and Shawar, Amalric retreated. This new alliance gave Nur ad-Din rule over virtually all of Syria and Egypt. Shawar was executed for his alliances with the Christian forces, and Shirkuh succeeded him as vizier of Egypt. In 1169, Shirkuh died unexpectedly after only weeks of rule. Shirkuh's successor was his nephew, Salah ad-Din Yusuf, commonly known as Saladin. Nur ad-Din died in 1174, leaving the new empire to his 11-year-old son, As-Salih. It was decided that the only man competent enough to uphold the jihad against the Franks was Saladin, who became sultan of Egypt and Syria and the founder of the Ayyubid dynasty. Amalric also died in 1174, leaving Jerusalem to his 13-year-old son, Baldwin IV. Although Baldwin suffered from leprosy, he was an effective and active military commander, defeating Saladin at the battle of Montgisard in 1177, with support from Raynald of Châtillon, who had been released from prison in 1176. Raynald later forged an agreement with Saladin to allow free trade between Muslim and Christian territories. He also raided caravans throughout the region and expanded his piracy to the Red Sea by sending galleys to raid ships, and to assault the city of Mecca itself. These acts enraged the Muslim world, giving Raynald a reputation as the most hated man in the Middle East. Baldwin IV died in 1185, and the kingdom was left to his nephew Baldwin V, whom he had crowned as co-king in 1183. Raymond III of Tripoli again served as regent. The following year, Baldwin V died before his ninth birthday, and his mother Princess Sybilla, sister of Baldwin IV, crowned herself queen and her husband, Guy of Lusignan, king. Raynald again raided a rich caravan and had its travelers thrown in prison. Saladin demanded that the prisoners and their cargo be released. The newly crowned King Guy appealed to Raynald to give in to Saladin's demands, but Raynald refused to follow the king's orders. This final act of outrage by Raynald gave Saladin the opportunity he needed to take the offensive against the kingdom, and in 1187 he laid siege to the city of Tiberias. Raymond advised patience, but King Guy, acting on advice from Raynald, marched his army to the Horns of Hattin outside of Tiberias. The Frankish army, thirsty and demoralized, was destroyed in the ensuing battle, and the city would not be held again by Christians until 1229. King Guy and Raynald were brought to Saladin's tent, where Guy was offered a goblet of water because of his great thirst. Guy took a drink and then passed the goblet to Raynald. Raynald's having received the goblet from King Guy rather than Saladin meant that Saladin would not be forced to offer protection to the treacherous Raynald (it was custom that if you were personally offered a drink by the host, your life was safe). When Raynald accepted the drink from King Guy's hands, Saladin told his interpreter, "say to the King: 'it is you who have given him to drink'". Afterwards, Saladin beheaded Raynald for past betrayals. Saladin honored tradition with King Guy, who was sent to Damascus and eventually ransomed to his people, one of the few captive Crusaders to avoid execution. By the end of the year, Saladin had taken Acre and Jerusalem. Pope Urban III is said to have collapsed and died upon hearing the news of the battle of Hattin. The new pope, Gregory VIII, proclaimed that the capture of Jerusalem was punishment for the sins of Christians across Europe. The cry went up for a new crusade to the Holy Land. Henry II of England and Philip II of France ended their war with each other, and both imposed a "Saladin tithe" on their citizens to finance the venture. In Britain, Baldwin of Exeter, the archbishop of Canterbury, made a tour through Wales, convincing 3,000 men-at-arms to take up the cross, recorded in the Itinerary of Giraldus Cambrensis. The elderly Holy Roman Emperor Frederick I Barbarossa responded to the call immediately. He took up the Cross at Mainz Cathedral on 27 March 1188 and was the first to set out for the Holy Land on 11 May 1189 with an army of 12,000–15,000 men, including 4,000 knights. Contemporary chroniclers gave a range estimates for Frederick's army, from 10,000 to 600,000 men, including 4,000–20,000 knights. A contingent of 2,000 men led by the Hungarian prince Géza, the younger brother of the king Béla III of Hungary, and Bishop Ugrin Csák also went with Barbarossa to the Holy Land. The Byzantine Emperor Isaac II Angelos attempted to forge a secret alliance with Saladin to impede Frederick's progress in exchange for his empire's safety, which failed. The Germans were delayed for six months in Thrace as the Byzantines refused to let them cross. After reaching Anatolia, Frederick was promised safe passage through the region by the Turkish Sultanate of Rum, but was faced instead with constant Turkish hit-and-run attacks on his army. A Turkish army of 10,000 men was destroyed at the Battle of Philomelion by 2,000 Crusaders, with 4,174–5,000 Turks slain. After continued Turkish raids against the Crusader army, Frederick decided to replenish his stock of animals and foodstuffs by conquering the Turkish capital of Iconium. On 18 May 1190, the German army crushed its Turkish enemies at the Battle of Iconium, sacking the city and killing 3,000 Turkish troops. While crossing the Saleph River on 10 June 1190, Frederick's horse slipped, throwing him against the rocks; he then drowned in the river. After this, much of his army returned to Germany by sea in anticipation of the upcoming Imperial election. The Emperor's son, Frederick of Swabia, led the remaining 5,000 men to Antioch. There, the Emperor's body was boiled to remove the flesh, which was interred in the Church of St. Peter; his bones were put in a bag to continue the crusade. In Antioch, however, the German army was further reduced by fever. Young Frederick had to ask the assistance of his kinsman Conrad of Montferrat to lead him safely to Acre, by way of Tyre, where his father's bones were buried. While the Imperial army did not achieve its objective of capturing Jerusalem, it had inflicted considerable damage on Turkish forces, with more than 9,000 Turkish soldiers killed in all battles and skirmishes combined. The early departure of the bulk of the German army after Frederick's death inspired his son, Henry VI, Holy Roman Emperor, seven years later to sponsor the German Crusade of 1197. King Henry II of England died on 6 July 1189 after a surprise attack by his son Richard the Lionheart and King Philip II. Richard inherited the crown and immediately began raising funds for the crusade. In the meantime, some of his subjects departed in multiple waves by sea. Some of them together with contingents from the Holy Roman Empire and France conquered the Moorish city of Silves in Iberia during the summer of 1189, before continuing to the Holy Land. In April 1190, King Richard's fleet departed from Dartmouth under the command of Richard de Camville and Robert de Sablé on their way to meet their king in Marseille. Parts of this fleet helped the Portuguese monarch Sancho I defeat an Almohad counterattack against Santarém and Torres Novas, while another group ransacked Christian Lisbon, only to be routed by the Portuguese monarch. Richard and Philip II met in France at Vézelay and set out together on 4 July 1190 as far as Lyon where they parted after agreeing to meet in Sicily; Richard with his retinue, said to number 800, marched to Marseille and Philip to Genoa. Richard arrived in Marseille and found that his fleet had not arrived; he quickly tired of waiting for them and hiring ships, left for Sicily on 7 August, visiting several places in Italy en route and arrived in Messina on 23 September. Meanwhile, the English fleet eventually arrived in Marseille on 22 August, and finding that Richard had gone, sailed directly to Messina, arriving before him on 14 September. Philip had hired a Genoese fleet to transport his army, which consisted of 650 knights, 1,300 horses, and 1,300 squires to the Holy Land by way of Sicily. William II of Sicily had died the previous year, and was replaced by Tancred, who imprisoned Joan of England—William's wife and King Richard's sister. Richard captured the city of Messina on 4 October 1190 and Joan was released. Richard and Philip fell out over the issue of Richard's marriage, as Richard had decided to marry Berengaria of Navarre, breaking off his long-standing betrothal to Philip's half-sister Alys. Philip left Sicily directly for the Middle East on 30 March 1191 and arrived in Tyre in mid-May; he joined the siege of Acre on 20 May. Richard did not set off from Sicily until 10 April. Shortly after setting sail from Sicily, King Richard's armada of 180 ships and 39 galleys was struck by a violent storm. Several ships ran aground, including one holding Joan, his new fiancée Berengaria and a large amount of treasure that had been amassed for the crusade. It was soon discovered that Isaac Dukas Comnenus of Cyprus had seized the treasure. The young women were unharmed. Richard entered Limassol on 6 May and met with Isaac, who agreed to return Richard's belongings and to send 500 of his soldiers to the Holy Land. Richard made camp at Limassol, where he received a visit from Guy of Lusignan, the King of Jerusalem, and married Berengaria, who was crowned queen. Once back at his fortress of Famagusta, Isaac broke his oath of hospitality and began issuing orders for Richard to leave the island. Isaac's arrogance prompted Richard to conquer the island within days, finally leaving on 5 June 1191. Saladin released King Guy from prison in 1189. Guy attempted to take command of the Christian forces at Tyre, but Conrad of Montferrat held power there after his successful defence of the city from Muslim attacks. Guy turned his attention to the wealthy port of Acre. He amassed an army to besiege the city and received aid from Philip's newly arrived French army. The combined armies were not enough to counter Saladin, however, whose forces besieged the besiegers. In summer 1190, in one of the numerous outbreaks of disease in the camp, Queen Sibylla and her young daughters died. Guy, although only king by right of marriage, endeavoured to retain his crown, although the rightful heir was Sibylla's half-sister Isabella. After a hastily arranged divorce from Humphrey IV of Toron, Isabella was married to Conrad of Montferrat, who claimed the kingship in her name. During the winter of 1190–91, there were further outbreaks of dysentery and fever, which claimed the lives of Frederick of Swabia, Patriarch Heraclius of Jerusalem, and Theobald V of Blois. When the sailing season began again in spring 1191, Leopold V of Austria arrived and took command of what remained of the imperial forces. Philip of France arrived with his troops from Sicily in May. A neighboring army under Leo II of Cilician Armenia also arrived. Richard arrived at Acre on 8 June 1191 and immediately began supervising the construction of siege weapons to assault the city, which was captured on 12 July. Richard, Philip, and Leopold quarrelled over the spoils of the victory. Richard cast down the German standard from the city, slighting Leopold. In the struggle for the kingship of Jerusalem, Richard supported Guy, while Philip and Leopold supported Conrad, who was related to them both. It was decided that Guy would continue to rule but that Conrad would receive the crown upon his death. Frustrated with Richard (and in Philip's case, in poor health), Philip and Leopold took their armies and left the Holy Land in August. Philip left 7,000 French crusaders and 5,000 silver marks to pay them. On 18 June 1191, soon after Richard's arrival at Acre, he sent a messenger to Saladin requesting a face to face meeting. Saladin refused, saying that it was customary for kings to meet each other only after a peace treaty had been agreed, and thereafter "it is not seemly for them to make war upon each other". The two therefore never met, although they did exchange gifts and Richard had a number of meetings with Al-Adil, Saladin's brother. Saladin tried to negotiate with Richard for the release of the captured Muslim soldier garrison, which included their women and children. On 20 August, however, Richard thought Saladin had delayed too much and had 2,700 of the Muslim prisoners decapitated in full view of Saladin's army, which tried unsuccessfully to rescue them. Saladin responded by killing all of the Christian prisoners he had captured. After the capture of Acre, Richard decided to march to the city of Jaffa. Control of Jaffa was necessary before an attack on Jerusalem could be attempted. On 7 September 1191, however, Saladin attacked Richard's army at Arsuf, 30 miles (50 km) north of Jaffa. Saladin attempted to harass Richard's army into breaking its formation in order to defeat it in detail. Richard maintained his army's defensive formation, however, until the Hospitallers broke ranks to charge the right wing of Saladin's forces. Richard then ordered a general counterattack, which won the battle. Arsuf was an important victory. The Muslim army was not destroyed, despite losing 7,000 men, but it did rout; this was considered shameful by the Muslims and boosted the morale of the Crusaders. Arsuf had dented Saladin's reputation as an invincible warrior and proved Richard's courage as soldier and his skill as a commander. Richard was able to take, defend, and hold Jaffa, a strategically crucial move toward securing Jerusalem. By depriving Saladin of the coast, Richard seriously threatened his hold on Jerusalem. Following his victory at Arsuf, Richard took Jaffa and established his new headquarters there. He offered to begin negotiations with Saladin, who sent his brother, Al-Adil (known as 'Saphadin' to the Franks), to meet with Richard. Negotiations, which included an attempt to marry Richard's sister Joan to Al-Adil, failed, and Richard marched to Ascalon, which had been recently demolished by Saladin. In November 1191 the Crusader army advanced inland towards Jerusalem. On 12 December Saladin was forced by pressure from his emirs to disband the greater part of his army. Learning this, Richard pushed his army forward, spending Christmas at Latrun. The army then marched to Beit Nuba, only 12 miles from Jerusalem. Muslim morale in Jerusalem was so low that the arrival of the Crusaders would probably have caused the city to fall quickly. Appallingly bad weather, cold with heavy rain and hailstorms, combined with fear that if the Crusader army besieged Jerusalem, it might be trapped by a relieving force, led to the decision to retreat back to the coast. Richard called on Conrad to join him on campaign, but he refused, citing Richard's alliance with King Guy. He too had been negotiating with Saladin as a defence against any attempt by Richard to wrest Tyre from him for Guy. However, in April, Richard was forced to accept Conrad as king of Jerusalem after an election by the nobles of the kingdom. Guy had received no votes at all; Richard sold him Cyprus as compensation. Before he could be crowned, Conrad was stabbed to death by two Hashshashin in the streets of Tyre. Eight days later, Richard's nephew Henry II of Champagne married Queen Isabella, who was pregnant with Conrad's child. It was strongly suspected that the king's killers had acted on instructions from Richard. During the winter months, Richard's men occupied and refortified Ascalon, whose fortifications had earlier been razed by Saladin. The spring of 1192 saw continued negotiations and further skirmishing between the opposing forces. On 22 May the strategically important fortified town of Darum on the frontiers of Egypt fell to the crusaders, following five days of fierce fighting. The Crusader army made another advance on Jerusalem, and in June it came within sight of the city before being forced to retreat again, this time because of dissention amongst its leaders. In particular, Richard and the majority of the army council wanted to force Saladin to relinquish Jerusalem by attacking the basis of his power through an invasion of Egypt. The leader of the French contingent, the Duke of Burgundy, however, was adamant that a direct attack on Jerusalem should be made. This split the Crusader army into two factions, and neither was strong enough to achieve its objective. Richard stated that he would accompany any attack on Jerusalem but only as a simple soldier; he refused to lead the army. Without a united command the army had little choice but to retreat back to the coast. In July 1192, Saladin's army suddenly attacked and captured Jaffa with thousands of men, but Saladin lost control of his army due to their anger for the massacre at Acre. It is believed that Saladin even told the Crusaders to shield themselves in the Citadel until he had regained control of his army. Richard had intended to return to England when he heard the news that Saladin and his army had captured Jaffa. Richard and a small force of little more than 2,000 men went to Jaffa by sea in a surprise attack. Richard's forces stormed Jaffa from their ships and the Ayyubids, who had been unprepared for a naval attack, were driven from the city. Richard freed those of the Crusader garrison who had been made prisoner, and these troops helped to reinforce the numbers of his army. Saladin's army still had numerical superiority, however, and they counter-attacked. Saladin intended a stealthy surprise attack at dawn, but his forces were discovered; he proceeded with his attack, but his men were lightly armoured and lost 700 men killed due to the missiles of the large numbers of Crusader crossbowmen. The battle to retake Jaffa ended in complete failure for Saladin, who was forced to retreat. This battle greatly strengthened the position of the coastal Crusader states. On 2 September 1192, following his defeat at Jaffa, Saladin was forced to finalize a treaty with Richard providing that Jerusalem would remain under Muslim control, while allowing unarmed Christian pilgrims and traders to visit the city. Ascalon was a contentious issue as it threatened communication between Saladin's dominions in Egypt and Syria; it was eventually agreed that Ascalon, with its defences demolished, be returned to Saladin's control. Richard departed the Holy Land on 9 October 1192. Neither side was entirely satisfied with the results of the war. Though Richard's victories had deprived the Muslims of important coastal territories and re-established a viable Frankish state in Palestine, many Christians in the Latin West felt disappointed that he had elected not to pursue the recapture of Jerusalem. Likewise, many in the Islamic world felt disturbed that Saladin had failed to drive the Christians out of Syria and Palestine. Trade flourished, however, throughout the Middle East and in port cities along the Mediterranean coastline. 'I fear to make peace, not knowing what may become of me. Our enemy will grow strong, now that they have retained these lands. They will come forth to recover the rest of their lands and you will see every one of them ensconced on his hill-top,' meaning in his castle, 'having announced, "I shall stay put" and the Muslims will be ruined.' These were his words and it came about as he said. Richard was arrested and imprisoned in December 1192 by Leopold V, Duke of Austria, who suspected Richard of murdering Leopold's cousin Conrad of Montferrat. Leopold had also been offended by Richard casting down his standard from the walls of Acre. He was later transferred to the custody of Henry VI, Holy Roman Emperor, and it took a ransom of one hundred and fifty thousand marks to obtain his release. Richard returned to England in 1194 and died of a crossbow bolt wound in 1199 at the age of 41. In 1193, Saladin died of yellow fever. His heirs would quarrel over the succession and ultimately fragment his conquests. Henry of Champagne was killed in an accidental fall in 1197. Queen Isabella then married for a fourth time, to Amalric of Lusignan, who had succeeded his brother Guy, positioned as King of Cyprus. After their deaths in 1205, her eldest daughter Maria of Montferrat (born after her father's murder) succeeded to the throne of Jerusalem. ...the Third Crusade was by almost any measure a highly successful expedition. Most of Saladin's victories in the wake of Hattin were wiped away. The Crusader kingdom was healed of its divisions, restored to its coastal cities, and secured in a peace with its greatest enemy. Although he had failed to reclaim Jerusalem, Richard had put the Christians of the Levant back on their feet again. Accounts of events surrounding the Third Crusade were written by the anonymous authors of the Itinerarium Peregrinorum et Gesta Regis Ricardi (a.k.a. the Itinerarium Regis Ricardi), the Old French Continuation of William of Tyre (parts of which are attributed to Ernoul), and by Ambroise, Roger of Howden, Ralph of Diceto, and Giraldus Cambrensis. ^ a b c Loud 2010, p. 19. ^ a b c d e Frank McLynn. "Richard and John: Kings at War." Page 219. ^ Hans E. Mayer, The Crusades. Oxford University Press, 1965 (trans. John Gillingham, 1972), p. 139. ^ Frank McLynn, "Richard and John: Kings at War," 2007, page 174. ^ Loud 2010, p. 45. ^ Angold 2016, p. 297-298. ^ Loud 2010, p. 102–103. ^ Loud 2010, p. 104. ^ Loud 2010, pp. 109–111. ^ Loud 2010, p. 181. ^ Loud 2010, pp. 97–111. ^ L. Villegas-Aristizábal, "Revisión de las crónicas de Ralph de Diceto y de la Gesta regis Ricardi sobre la participación de la flota angevina durante la Tercera Cruzada en Portugal", Studia Historica- Historia Medieval 27 (2009), pp. 153–70. ^ Procter, George (1854). History of the crusades: their rise, progress, and results. R. Griffin and Co. pp. 112–16. Asbridge, T., The Crusades: The War for the Holy Land (London, 2010). Angold, Michael (2016). "The Fall of Jerusalem (1187) as viewed from Byzantium". In Boas, Adrian (ed.). The Crusader World. Routledge. Edde, A-M., Saladin, trans. J.M. Todd (London, 2011). Oman, C.W.C., (1924) A History of the Art of War in the Middle Ages Vol. I, 378–1278 AD. London: Greenhill Books; Mechanicsburg, Pennsylvania: Stackpole Books, reprinted in 1998. Wikimedia Commons has media related to Third Crusade.